Winter is a quiet time for us butterfly and moth enthusiasts with few species on the wing. But it needn’t be so. 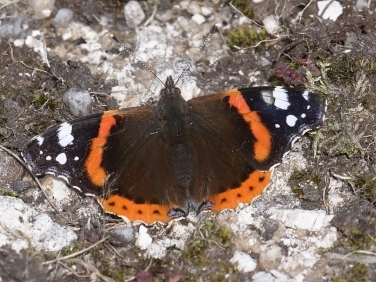 As part of a survey to improve our knowledge of over wintering butterfly and moths in Cornwall the inspection of outhouses, greenhouses and garden sheds is being encouraged. November and December have seen unusually large numbers of late flying Clouded Yellows and Red Admirals in the county. Whether this will result in greater numbers successfully overwintering as either eggs, larvae, pupae or adults remains to be seen. A few Red Admirals are still being reported in flight such as the one in our Falmouth garden on the 15th December. And an early instar caterpillar was also found tucked away inside its nettle tent (see right). It will be interesting to see how this caterpillar develops through the winter. Other reports in recent days of butterflies in farmers barns, houses and garden sheds suggest the cooling weather is now encouraging some species to move into sheltered places in preparation to over winter. 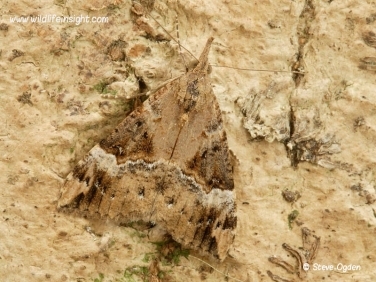 The Bloxworth Snout is a regular over wintering moth in our garden shed in Falmouth and is almost certainly under recorded in Cornwall so perhaps the survey will shed some light on its distribution. Another moth, The Hummingbird Hawk-moth, is thought to now overwinter and it would be particularly interesting to receive confirmation of this. It is easily over looked when stationary and for those unfamiliar with it photos can be seen on the highlighted link above. All sightings of adult moths, butterflies, caterpillars, pupae or eggs during the winter are welcome. If uncertain of identification forward an image and I’ll have a go! In the last few weeks the Angle Shades caterpillar has been the most common species reported including both brown and green forms.